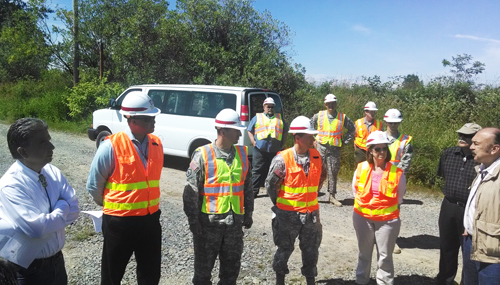 The Army Corps of Engineers toured the Qwuloolt Estuary, located in Marysville, on Wednesday, June 25, as part of a transitional period. Colonel Bruce Estok is stepping down from his position with the corps, and is introducing his successor, Colonel John Buck, to some of the communities and projects the corps is involved with. The Qwuloolt Estuary project is an example of successful collaboration between the corps and local communities with specific interests. 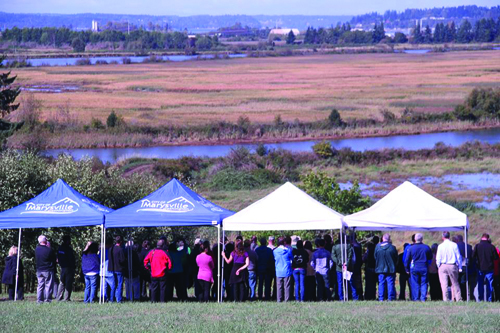 The Qwuloolt Estuary was chosen as a project site tour for a few reasons, mainly the unique relationship the corps has with Tulalip, and the importance of the project in reaching the goal of restoring the waters of Puget Sound. “The estuary has been deemed a crucial habitat for salmon for a long time. It is crucial to any watershed. 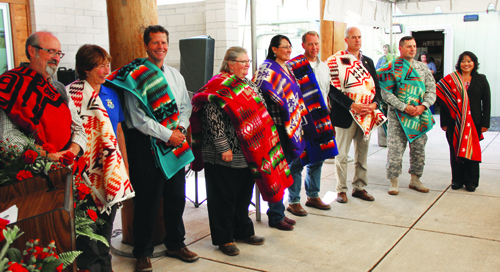 It is the place where life happens, where the land meets the sea,” said Kurt Nelson, Environmental Division Manager for the Tulalip Natural Resources Department. Col. Estok explained that the corps projects are not really part of the president’s budget, mostly due to a lack of feasibility plan. Because of that, funding is often uncertain, so the projects remain uncertain right up until the first day work actually begins. “Tulalip Tribes is our unofficial sponsor,” said Col. Estok. He and Nelson explained that the funding for Qwuloolt largely comes from 21 grants the tribe secured to cover project costs. Grant funding often has time constraints, which means the funds might not be available by the time the Army Corps of Engineers process is complete. That is one major obstacle that had to be overcome for Qwuloolt. Col. Estok noted that this is not the first collaborative effort between the corps and the Tulalip Tribes. “We have the first in-lieu fee mitigation plan with a tribe. That’s a good relationship, one that we want to keep building on,” he said. For more information about the Qwuloolt Estuary, visit www.qwuloolt.org. Quilceda marsh, currently owned by The Tulalip Tribes, looking southwest down Steamboat Slough of the Snohomish River toward Port Gardner, Wa. TULALIP, WA-Wetlands are widely agreed to be some of the most beautiful places on Earth, with an array of wild and plant life that spark joy in the hearts of many. “For many of us, water simply flows from a faucet, and we think little about it beyond this point of contact. We have lost a sense of respect for the wild river, for the complex workings of a wetland, for the intricate web of life that water supports.” -Sandra Postel, founder and director of Global Water and Policy Project, author of “Last Oasis: Facing Water Scarcity”, 2003. 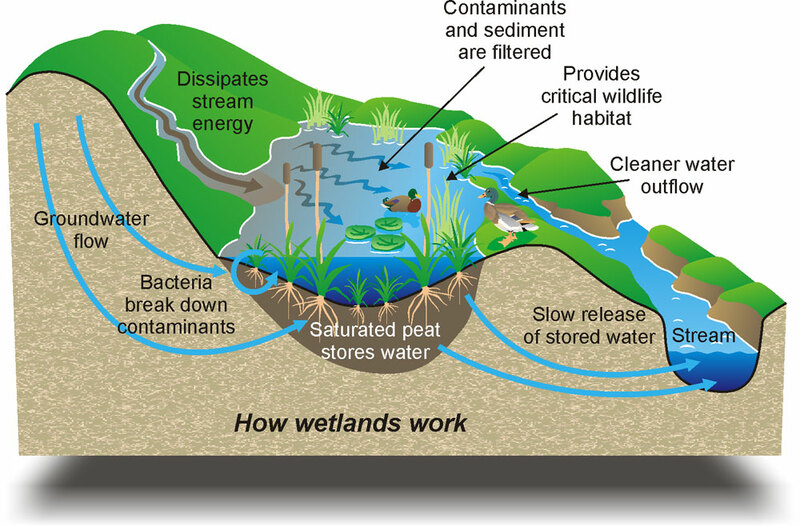 Wetlands can be considered the hub of life, where land and water meet you will find an overabundance of life flourishing. Currently most wetlands are threatened with rising sea levels, pollutants and development. A recent study conducted by Restore America’s Estuary, on the Snohomish estuary, begins to pinpoint the essential need for healthy estuaries and their link to global health. For the study, soil samples (from Smith Island, Spencer Island and Qwuloolt to name a few) were taken in order to establish a count of CO2 emissions that are captured and stored within estuaries that vary in health condition. 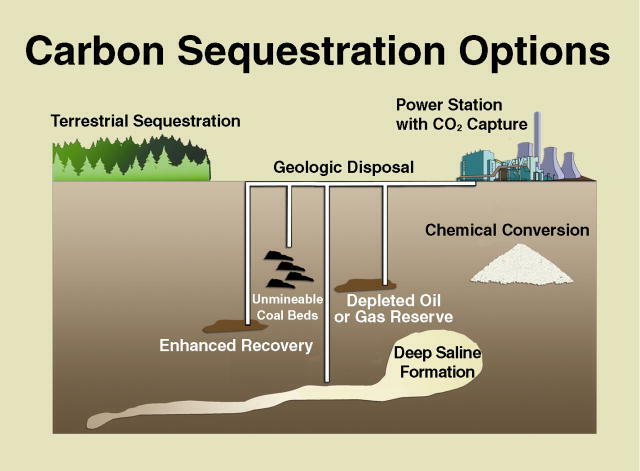 There are numerous ways to remove carbon emissions, most are natural and work through plant life such as forests while others are less natural and work through power plants that capture CO2 and bury it back into the earth or ocean. Coastal wetlands have been labeled as Blue Carbon sequesters and have been found to greatly reduce atmospheric CO2 emissions. Throughout the USA, tidal marshes, tidal forests, saltmarsh grasses, seagrasses, and the mangroves along the Gulf Coast are more effective at sequestering carbon (up to a 100 times faster) and are able to store it for longer periods of time as compared to forests. Through this study a blue carbon working group can be established which will focus, for years to come, on restoring and monitoring Pacific Northwest region coastal wetlands in order to continue collecting and analyzing data which will help to influence better-quality land management, update policies that could one day apply to wetlands nationally. Due to human impact, coastal wetlands are disappearing at a rapid rate, “at current conversion rates, 30–40% of tidal marshes and seagrasses and nearly 100% of mangroves could be lost in the next 100 years.” (Estimating Global “Blue Carbon” Emissions from Conversion and Degradation of Vegetated Coastal Ecosystems.Pendleton et al., 2012). Although, both are time consuming, maintenance of estuaries is more cost effective than restoring and with rising sea levels (estuary health and life depend on average sea levels), estuaries are losing ground and time has become an issue as well. 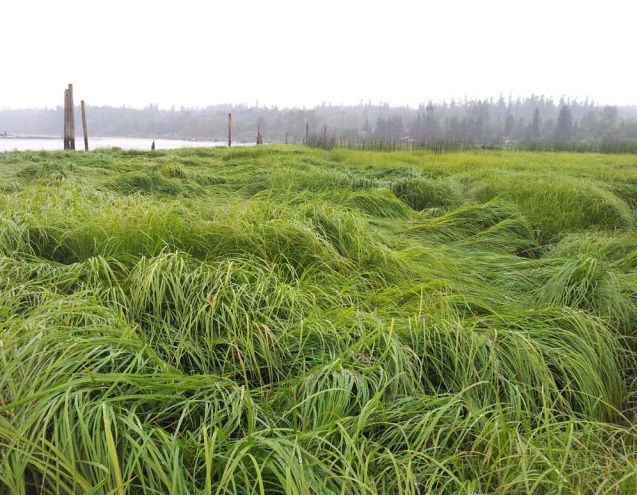 This national loss of wetlands has branded the Snohomish Estuary as an excellent case study for restoration and estimates of carbon storage. “Coastal Blue Carbon Opportunity Assessment for Snohomish Estuary: The Climate Benefits of Estuary Restoration” finds that currently planned and in-construction restoration projects in the Snohomish estuary will result in at least 2.55 million tons of CO2 sequestered from the atmosphere over the next 100-years. This is equivalent to the 1-year emissions for 500,000 average passenger cars. If plans expanded to fully restore the Snohomish estuary, the sequestration potential jumps to 8.8 million tons of CO2 or, in other terms, equal to the 1-year emissions of about 1.7 million passenger cars. In addition to the climate benefits outlined by the study, healthy and restored estuaries act as spawning grounds and nurseries for commercially and recreationally important fish and shellfish species, provide storm buffers for coastal communities, filter pollutants, and provide habitat for numerous species of fish and wildlife, as well as recreational opportunities for hundreds of millions of Americans annually.